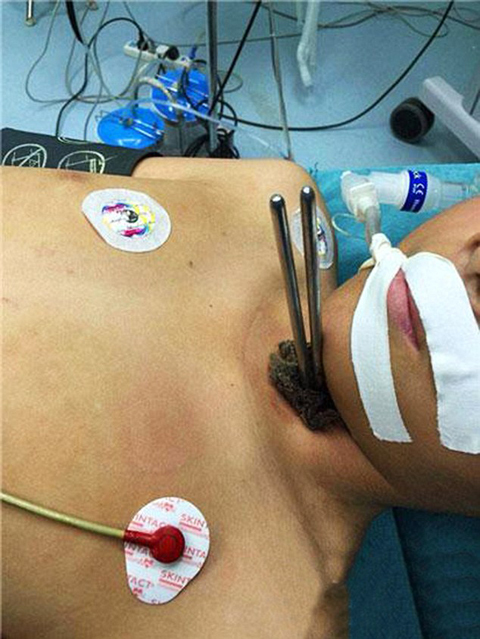 The steel chopsticks wedged into the 12 year old's neck after he was knocked over by a scooter. Jun Chia, a 12-year-old boy in Wuhan City, China, was just minding his own business, carrying some takeaway from a nearby noodle shop across his school playground, when he was hit by an electric scooter driven by one of his classmate’s parents. The boy fell to the ground after being hit, and the pair of steel chopsticks in his take-out bag wedged into his neck. Surprisingly, an x-ray showed that none of his key organs had been affected, and the boy will likely be discharged from the hospital by the end of the week. The chopsticks had missed Chia’s trachea, oesophagus, and key blood vessels, one doctor explained. Looks like Chia cheated death, and that he will be able to eat noodles again in the near future.